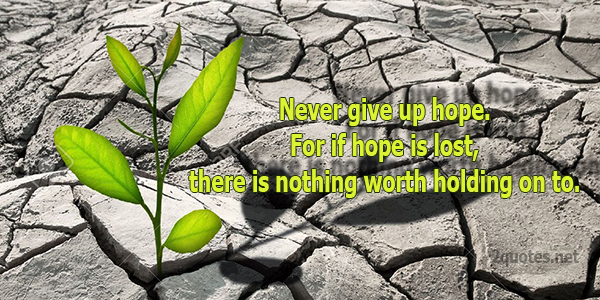 "Never give up hope. For if hope is lost, there is nothing worth holding on to"
1. Never give up hope. Situations can change over night, problems can dissolve in the light of a new day&apos;s sun. 2. The reason I never give up hope is because everything is so basically hopeless. 3. Never give up, never lose hope. Always have faith, it allows you to cope. Trying times will pass, as they always do. Just have patience, your dreams will come true. So put on a smile and live through your pain. Know it will pass and stregth you will gain. 4. Never lose hope. You never know what tomorrow may bring. 5. Hope is what keeps us going. Our hope keeps us strong and helps us motivate towards our goal. So never give up your hope no matter how hard the situation is right now. 6. Never give up hope. One day, when everything falls in to place, you&apos;ll realize everything you wished for, has finally come to be. It just takes a little time. 7. The reason I never give up hope is because everything is so basically hopeless. 8. Never give up hope. For if hope is lost, there is nothing worth holding on to. 9. Never give up hope because we do know what God has in store for us. 10. Never lose hope, be persistent and stubborn and never give up. There are many instances in history where apparent losers suddenly turn out to be winners unexpectedly, so you should never conclude all hope is lost.